Are you thinking about buying a Nissan e-NV200 Combi, but unsure that an electric vehicle is the right choice for you? Find the answers to frequently asked questions about driving electric here. To see which features and options are available on each grade, and to view detailed pricing information, please visit the Prices and Specifications Page. 1/ How can driving electric benefit me? The running costs of a Nissan e-NV200 are significantly lower than its petrol and diesel counterparts. It costs as little as 4p a mile^^^ to keep your e-NV200 on the road. Electric vehicle (EV) drivers are also exempt from Vehicle Excise Duty (VED), Company Car Tax**^^, the London Congestion Charge^^**, and also benefit from discounted or even free parking in some boroughs or council areas. Electric vehicles release zero emissions whilst driving making them the more environmentally friendly option. 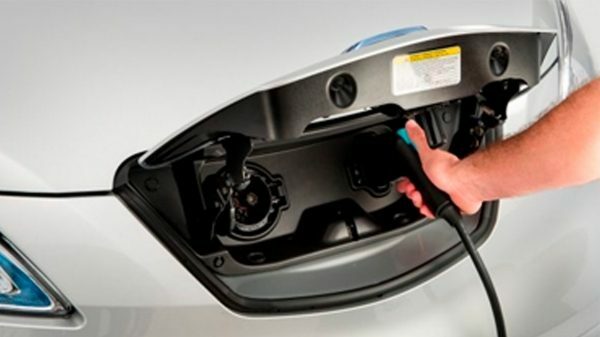 Electric vehicles such as the Nissan e-NV200 Combi can be charged at home using a Nissan approved home charging unit***, so you may never need to visit a fuel station. The battery powered electric drive of the e-NV200 Combi ensures a smooth and quiet drive while delivering instant torque for better performance. Thanks to its low centre of gravity it provides superior handling for an assured driving experience. 2/ How many people can you fit in the e-NV200 Combi? The Nissan e-NV200 Combi is available in 5 and 7 seat options. 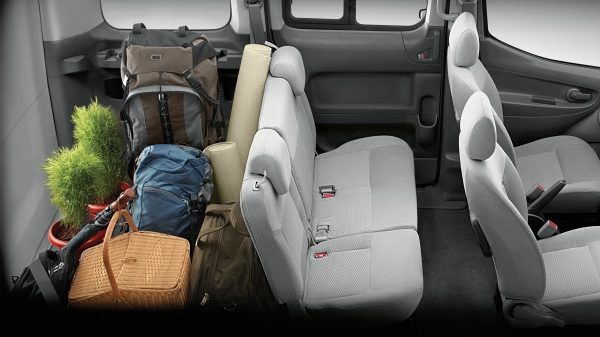 So whether you fill your e–NV200 with people or fold back the seats and fill it with cargo, the e-NV200 Combi has room for wherever your day takes you. 3/ How do I recharge the Van? You can charge your e-NV200 Combi at home, at the office or on the road. You can charge using a 3 pin plug in around 21.5 hours. You can use a home wall box unit to recharge in 7.5 hours and you can rapid charge from 20% to 80% in just 40-60 minutes***. Use our map to find public charging points that are available near you and help plan every journey from A to B. 4/ How far can the e-NV200 go on a single charge? The Nissan e-NV200 is now homologated using the new WLTP measure which better reflects the real life range of electric vehicles. Fitted with the 40kWh battery the e-NV200 now has a range of 124 miles (WLTP Combined Cycle) to 187 miles (WLTP City Cycle)**. This will be effected by several factors – for example how you drive, ambient temperatures and auxiliaries used (e.g. air conditioning), so be sure to select a more economical driving mode if you really want to make the most of the range. 5/ What are the key financial benefits of driving electric? The government is currently offering a grant to reduce the purchase price of an e-NV200 Combi by £3500^. Not only that but you’ll be exempt from vehicle excise duty (VED), the London Congestion Charge^** and pay reduced company car tax**^. In some areas, discounted or even free parking is available for electric vehicles too. Low-emission vehicles are vehicles that release reduced or zero emissions whilst driving. Fully electric vehicles like the Nissan e-NV200 produce zero emissions (0g/mile of CO₂). At Nissan, we believe in the potential of low-emission vehicles. We are working with local and national governments as well as other sectors to help further develop the necessary infrastructure to make low-emission mobility a reality. ARE ELECTRIC VEHICLES THE SAME AS HYBRID VEHICLES? Electric vehicles are often confused with hybrid vehicles, which operate on a combination of both an internal combustion engine and an electric motor. By contrast, electric vehicles like the Nissan LEAF and e-NV200, are solely powered by an electric motor – they require no fuel and release zero emissions whilst driving. WHAT ARE ELECTRIC VEHICLES LIKE TO DRIVE? Driving an electric vehicle like the Nissan e-NV200 is most similar to driving an incredibly smooth automatic vehicle – but with rapid acceleration, instant torque and a very quiet ride. The best way to understand how enjoyable driving an electric vehicle can be is to book a test drive and try one for yourself. ARE THERE ENVIRONMENTAL BENEFITS FROM ELECTRIC VEHICLES? Fully electric Nissan vehicles release zero emissions whilst driving - this reduces your footprint on the environment. The further you drive the greater the overall impact of driving electric. This impact will continue to grow as the UK's electricity-generation mix decarbonises. Electric and conventional vehicles are largely similar. Aside from the obvious difference in propulsion, the major differences are the fuelling and maintenance requirements. Rather than filling up at a petrol station, it is expected that most electric vehicles will be charged overnight at home. Also, electric vehicles have far fewer moving parts compared to a car with an internal-combustion engine, which reduces the service requirements. WHAT MODELS ARE AVAILABLE IN THE NISSAN E-NV200 RANGE? WHAT DOES NISSAN E-NV200 BRING TO MY DAILY EFFICIENCY? Driving the Nissan e-NV200 is a new experience: a smooth and quiet drive with an automatic gearbox... You are simply less tired, therefore, more efficient. IS THE NISSAN E-NV200 FRONT-WHEEL DRIVE, REAR-WHEEL DRIVE OR ALL-WHEEL-DRIVE? The Nissan e-NV200 is front-wheel drive. Nice and simple! BOOK AN E-NV200 TEST DRIVE? DOES NISSAN E-NV200 HAVE CRUISE CONTROL? Cruise control and a speed limiter are standard from mid-grade vehicles on both the e-NV200 Combi and e-NV200 van. WHAT IS THE PAYLOAD ? The Nissan e-NV200 can carry loads of up to 705kg for the Van and up to 658kg for the Combi. WHAT HIGH-TECH DRIVING AIDS DOES THE NISSAN E-NV200 HAVE? Depending on the grade you choose, the Nissan e-NV200 comes with various useful high-tech features, such as a rear color reversing camera, a navigation system, Hill Start Assist, Bluetooth and an Intelligent Key. WHERE IS THE BATTERY IN THE NISSAN E-NV200? The battery pack in the 100% electric e-NV200 is located in the floor, so it doesn't eat into the load space or cabin. It also lowers the center of gravity – which you’ll definitely notice when travelling around corners. You can charge your 100% electric e-NV200 at home or at public charging stations. In addition, many businesses are now installing workplace charging to aid their employees who have made the move to electric mobility. You simply plug your vehicle into the charge point using one of the 2 cables provided with the vehicle, or plug in the tethered cable attached to the charge point into the vehicle. We recommended you install a Nissan-approved home charging unit (HCU) if you're going to charge at home or at the office. Whilst on the road there are a growing number of publicly-accessible charge points across the UK. Your Nissan dealer will be able to assist you in arranging a home inspection and the installation of a HCU. Don't worry. 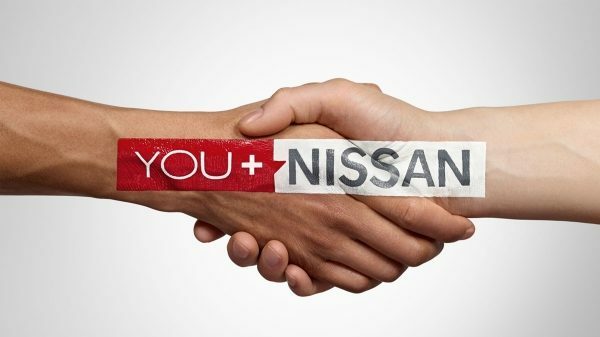 Nissan’s roadside assistance service is there for you as part of your warranty coverage. 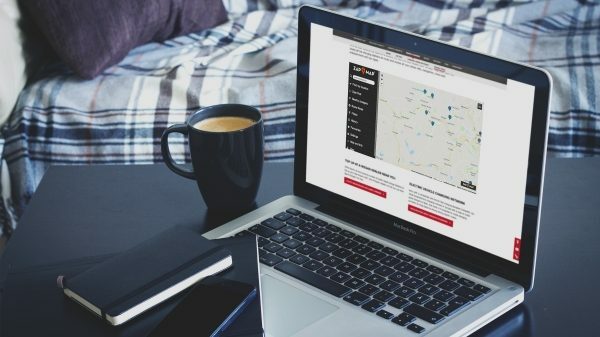 However, the advanced NissanConnect EV Navigation system of e-NV200 will constantly update you to show battery status, as well as the location of charging points along your route to help avoid this happening. WHAT IS THE BATTERY TECHNOLOGY? The Nissan e-NV200 uses a lithium-ion battery pack. IS THERE A SPECIAL WARRANTY FOR THE BATTERY? 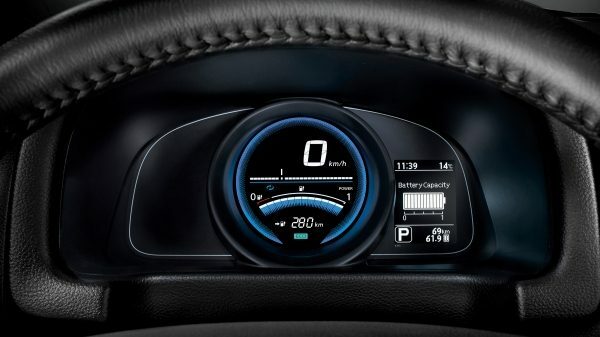 At Nissan, we are so confident in our lithium–ion battery that all Nissan e-NV200 40kW batteries are covered by an 8 year/ 100,000 mile warranty covering capacity loss below 9 bars of capacity (out of 12) as shown on the vehicle’s capacity gauge^^. 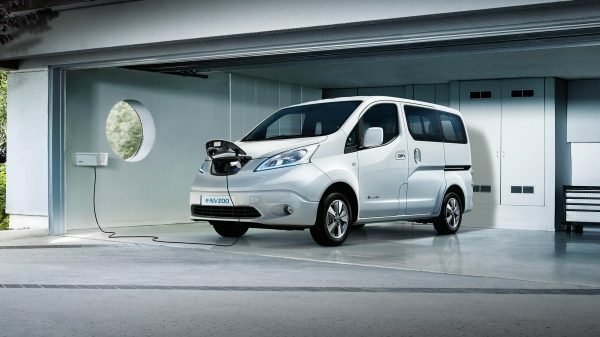 DOES THE NISSAN E-NV200 USE REGENERATIVE BRAKING TO HELP RECHARGE THE BATTERY? Yes, every time you coast or apply the brakes, the electric motor acts as a generator so the engine automatically recovers some of this wasted energy and returns it to the battery. When driving with B-mode turned-on the regenerative braking function is enhanced. HOW CAN I MAXIMISE MY DRIVING RANGE IN A 100% ELECTRIC E-NV200? The Nissan e-NV200 comes with a host of options to help you maximise your driving range. ECO mode minimises energy consumption by softening acceleration and reducing power consumption from the air conditioning unit. Increases regenerative braking, capturing more energy and transforming it into battery charge. B mode can be activated any time, whether or not you’re driving in ECO mode. The e-NV200's advanced route planner lets you plan the most energy-efficient route. Just set your parameters and the planner does the work. It’s just one of the many tools to help you get the most out of your battery’s charge. Set the air conditioning to start while your e-NV200 is still charging. That way, less battery power is lost when you're on the move and the cabin of your car is at a perfect temperature when you get behind the wheel. DOES USING THE HEATER REDUCE THE RANGE OF THE VEHICLE? Running the heater or the air conditioning will have an impact on how far you can drive. But what's really clever about the e-NV200 is that you can pre-heat or pre-cool your vehicle while it is charging, before you drive off. If you are plugged into your home charging unit or a public charging point, the power will come directly from the mains rather than from the battery which means it wont effect your range. The government is currently offering a 20% discount off the purchase price of an e-NV200 van (up to £8000) and a grant of £3500 off the purchase price of an e-NV200 Combi. Not only that but you’ll be exempt from vehicle excise duty (VED), the London Congestion Charge and pay reduced company car tax**^^. WHAT OTHER ADVANTAGES ARE THERE FOR EV DRIVERS? Do not underestimate the impact that driving an environmentally friendly and responsible vehicle will have on those around you. Driving a 100% electric vehicle like the Nissan e-NV200 is the signature of a sustainable way of life and sends a really positive message from you or your business. HOW IS THE INCENTIVE DEDUCTED FROM THE PRICE? Consumers will pay for the cost of the vehicle, less the incentive. Dealers will deduct the government grant at the point of sale, which Nissan will reclaim from the government^. I AM A FLEET MANAGER. HOW DO I GET IN TOUCH? **Stated range is based on Worldwide Harmonised Light Vehicles Test Procedure (WLTP). Range figures are obtained from laboratory testing and intended for comparisons between vehicles and may not reflect real driving results. Actual range may vary due to driving style, road condition, air conditioning and other factors outside of our control. *** Figures quoted are for a 40kWh battery:. Time dependent on charging conditions, including charger type and condition, battery temperature as well as ambient temperature at point of use. Indicated home (or office) charging requires use of a 32A / 6.6kW (7kW) wall box. Indicated rapid charging time requires use of a CHAdeMO rapid charger. ^Government applied Plug-in Car Grant (referred to as ‘Government Incentive’) will pay 35% of the purchase price, up to a maximum of £3,500 for e-NV200 Combi vehicles and 20% of the purchase price, up to a maximum of £8,000 for the e-NV200 Van. The amount of the grant will be automatically deducted from the price of the car at the time of purchase. For further details about our e-NV200 Combi incentives please visit our incentives page here. ^^^ By charging at night on British Gas’ standard tariff rates for a customer paying by direct debit as of May 2018, assuming seven hours of charging at night and one hour on the day rate. 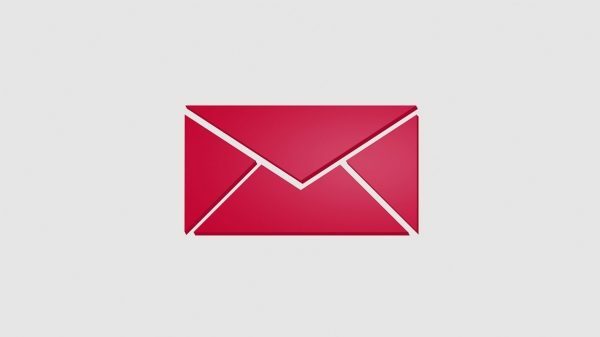 **^^ NMGB does not offer tax advice and recommends that all Company Car Drivers consult their own accountant with regards to their particular tax position.